One of the ways I love to procrastinate is by making spreadsheets. I know it’s weird, but I love making graphs of my progress and using formulas to track what I’m doing. I started back in November 2009, and have recorded the number of words I’ve written every day since then. The last two months of 2009 was clearly a very productive time, and I was able to more or less keep that up through 2010. In 2011 and 2012 I reduced my goals but kept more or less on track. Then 2013 sucked, relatively speaking. 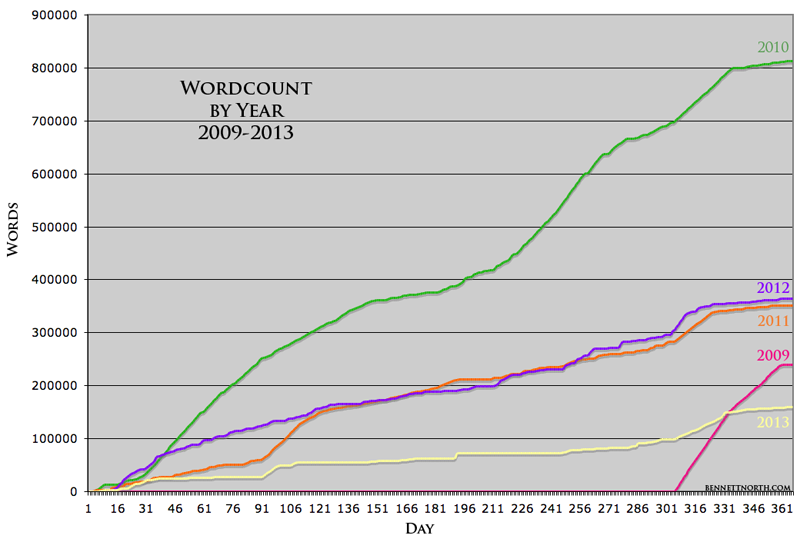 I wrote 80,000 words more in the last two months of 2009 than I did in the entirety of 2013. What’s the point of this all? Not much, really. Honestly the main thing I see here is the effect depression has on my writing. There are some who think writers need to suffer for their art, and that antidepressants stifle creativity, but based on my own anecdotal evidence, I’d have to disagree. Guess which year I was suffering from depression? Yep, that would be that dismal yellow line on the chart. And when did I start antidepressants that worked for me? That’s around day 301 on the chart, at the end of September/start of November 2013. See the way that line ticks up? I’m hoping that progress continues. I could go on for hours about my spreadsheets, but I don’t want to bore you. I think they’re a useful way of quantifying my writing process. They tell me when I’m doing better than I thought, and they tell me when I’m slacking off without realizing it. I’d recommend it for anyone who likes playing around with formulas. Don’t get TOO into it, though, because it’s as much a procrastination tool as YouTube, even if it makes you feel a little more productive.